Who's excited for the 4th of July? Some of you may know (if you've been following for a while) that it's my favorite holiday (tied with Thanksgiving), and it's also the twins birthday! They'll be turning four on Tuesday, and I still can't get over the fact that they'll be FOUR! We'll be celebrating up at the lake, and I'm excited for a weekend filled with barbecues, boat rides, fireworks, and time with the family. If you're wondering what to wear this 4th, I'm sharing a little outfit inspiration for you today. In my opinion, you can never go wrong with a stripe skirt, which also happens to be on my list of summer wardrobe essentials. 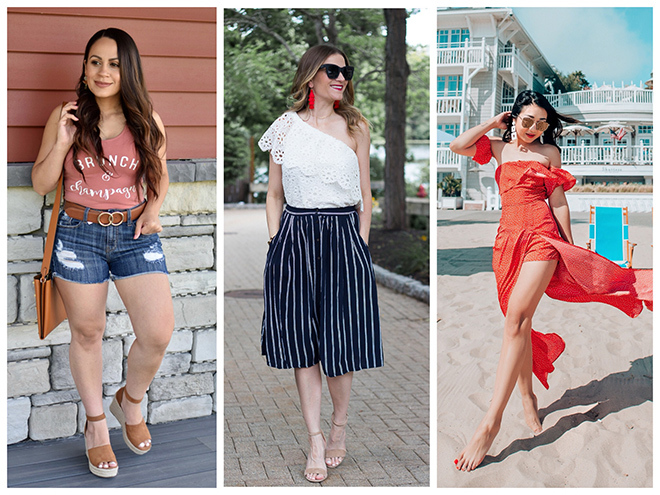 Not only are they classic, but I love how they can be styled for many occasions, including a day at the beach, to a night out on the town. 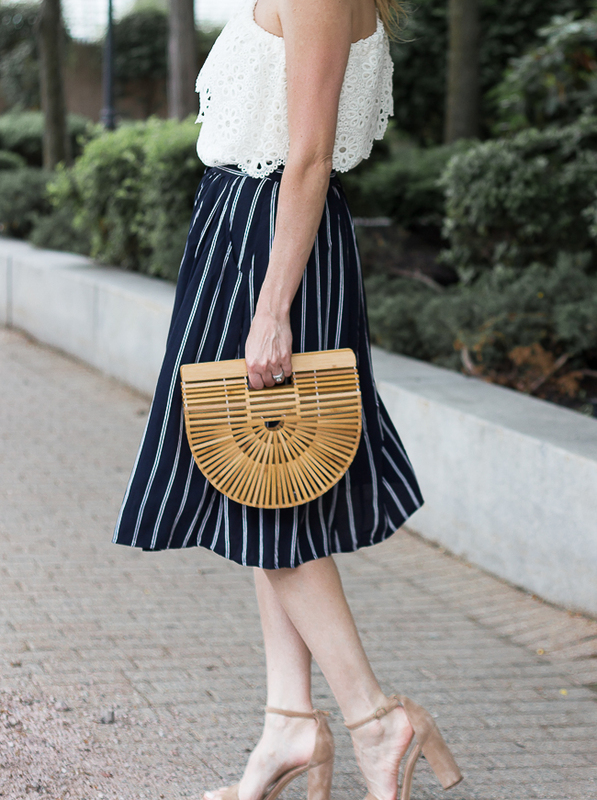 I added this stripe midi skirt to my wardrobe last summer, and it has definitely gotten its wear. I found it at Forever 21, and although it is no longer available, I found two similar options, here and here, which I'm actually liking more than my skirt! I paired it with my eyelet, one shoulder top, then added a pop of red with statement earrings and a bold lip. This look would make a perfect option for a 4th of July party or event, however, you can simply dress it down by switching out the heeled sandals for slides, or the lace top for a basic white tee or tank. Since the lake is very casual, I plan on wearing this skirt with my bathing suit (because I'll be living in my swimsuit over the holiday), and I'll wear this eyelet top with my favorite denim cut-offs, and these white slides. This top also comes in a poppy red color, which would be great for the holiday too, although sizes are limited. Do you know what you'll be wearing for the 4th? For more outfit inspiration, make sure to check out my last post here. Top | Skirt (old, similar here) | Bag | Heels | Sunglasses | Earrings | Bracelet | Necklace | Lip Color: LipSense in Blu-Red. The feature blogger is Yvonne of Funky Forty. I'm in love with her look, and how she combines all of the summer trends into one outfit. Make sure to visit her blog for her styling tips, and to say hello! I believe that there are two types of shirts that every woman should have in her wardrobe. The first is a classic white button down, and the second is a chambray. Both are classic, versatile, and will never go out of style. The truth is, I didn't own a long sleeve chambray until I received my latest Stitch Fix shipment. I own a sleeveless one, which is on constant rotation, but I hadn't yet added a long sleeve version to my wardrobe. Trust me, it was on my list items to purchase, so I saw this chambray by Liverpool in my Fix, I was very excited to try it on. Not only did I fall in love with the cut (not too fitted, yet not too boxy), ), but it's super soft. I think it's the softest chambray that I have ever tried on! Although I can pretty much style it with EVERYTHING in my wardrobe, I decide to pair it with my favorite denim shorts for a relaxed version of the good ole Canadian Tuxedo. Because chambray always makes a perfect option for the 4th of July, and I'm very excited for the upcoming holiday, I finished my look with my white slides, and added a pop of red with my earring and lip color. If you're not a fan of the denim on denim look, I would switch out the denim shorts for a pair of white ones. You can also pair it with printed shorts, white pants, or throw it on over a casual dress for added warmth. 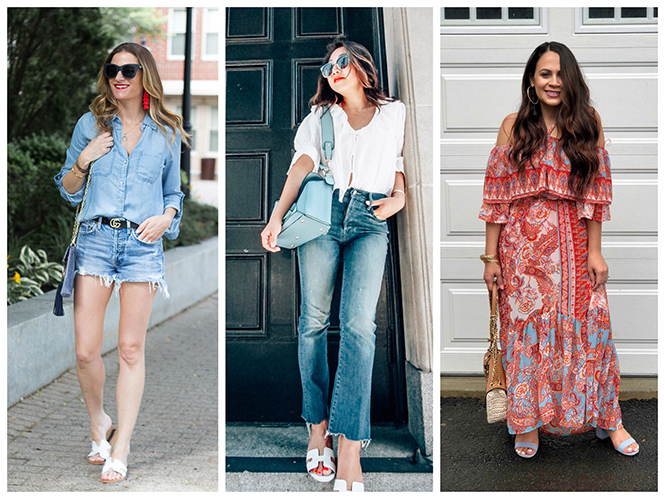 The ways to style a chambray are endless! Although this Liverpool Betty Chambray is only available through Stitch Fix, I did round up some chambray options that I'm loving below. This ended up being the only item that I kept from my latest Fix, but I do have to say it was another great one. If I weren't on a budget, I would have kept more! If you'd like to see what else came in my Fix, head over to my Instagram account, as I did a try-on session for my Stories. You can find it under my Stitch Fix highlight. If you're unfamiliar with Stitch Fix, it is a personal styling service where items are picked out based upon your style preferences, and delivered right to your door step. Upon signing up, you are asked questions about your style, then assigned a stylist who picks out five items per shipment to send you. You have three days to try on the clothes and decide what you want to keep or send back. This is the best part about the service, since you are able to do this in the comfort of your own home. You simply keep what you want, and send the rest back in the prepaid shipping bag that is provided. There is a styling fee with each box of $20, however, if you decide to purchase items from your box, then the $20 is put towards your purchase. If you decide to keep all 5 items, then you get a 25% discount! And it's for everyone. Stitch Fix carries women sizes from XS-3X, men's, petite and maternity! You can check out my last Stitch Fix review here. The feature blogger is Suzanne from Crazy Blonde Life. I'm loving her cropped jeans, and can we talk about her Gucci bag? Drool! Make sure to visit her blog and say hello. *This post contains sponsored content and affiliate links. All opinions are my own. Hi friends! I'm excited to share today's outfit with you for two reasons. First, because it's finally warm enough (here in New England) to wear shorts, and second, because it includes two of my favorite summer trends: high waist shorts and button detailing. I've been all about the high waist (and tie front) shorts trend. You all know I love a good pair of high waist bottoms, and I couldn't be happier with the fit of these stripe shorts! Non only do they hide my mom pudge, but I love length and slight baggy fit. Although they are not technically linen (I believe they are a polyester blend), they have a linen-like feel, which is perfect for the summer. They are also super comfortable (hello elastic waistband), and I can see myself styling them both casually or dressing them up (I'm thinking a lunch with a white blazer). For today's look I decided to pair them with my new button front camisole, which brings to my other favorite summer trend. I've been seeing buttons on everything from tops, to jumpsuits, and dresses, and love the fun detail they add. I found this camisole at Nordstrom, and know that it will be my summer go-to. It's easy to throw on with shorts, or layer under a blazer for the office. Plus, it is made of linen, making light and breathable on those hot and humid days. *Sizing note. These shorts are a size medium and fit perfectly (I wear a size 26/27 jean). I could probably get away with the small, but I like that they have a baggier fit. My camisole runs a little big. I am wearing the small which I find perfect on my 5'7' frame. It's available in three colors, but hurry, they have been selling fast. I noticed that the Extra-Small and Small were sold out in all three colors, but just got restocked in the tan! The feature blogger is Nancy from Nancy's Fashion Style. I'm loving how she styled her polka dot skirt. Such a fun piece, and I love the retro vibe. Make sure to visit her blog and say hello! *This post contains sponsored content and affiliate links. All opinions are my own. Thank you for supporting the brands that I love here on Threads for Thomas. Is there anything more perfect for the summer than a floral maxi dress? The truth is, it's not everyday that you'll catch me wearing a maxi dress, especially one that's on the flowy side. It's not because I don't like them, I actually love the look of maxi dresses. It's just that I have never able to find one that's flattering on my figure. Being tall, with a larger bust, these types of dresses usually fall in a way that give me a wider appearance, and lets me honest, no one really wants that. However, when I saw this cute floral maxi dress on the Shein website, I thought I'd give it a try. I'm so happy I did! No only does it fall perfectly on my frame, but it's also not too short! Tall girls, can I get a high five! For my shorter friends, this is a dress that can be easily hemmed. Now, I understand that it's annoying having to get everything hemmed, but at least you have that option. There are so many pieces that fall too short on me that I wish I could make work, but unfortunately you can't add length to an item. In addition to the length, I love the dark floral print, and the fabric is nice a light (yet not too thin) making it ideal for the summer. Because this dress can be very versatile, I decided to show you two different ways that it can be styled. The first is an easy daytime look. I just threw it on with a pair of flat sandals, and I was done! I did layer a bandeau underneath, as the back and sides of the dress fall on the low side, revealing a bra. A bralette would be a great option to layer under it too! For the second look, I decided to give it a dressier feel by adding a belt, which gave me more shape. I switched out my flats for heeled sandals, and instantly I had a perfect outfit for a bridal shower, dinner rehearsal, or summer cocktail event. Another styling tip: the day I shot these photos it was on the cooler side, so I layered a linen sweater over, and love that it gave the appearance of a skirt. A chambray or white button down, knotted at the bottom, would also be super cute layered over this dress. The feature blogger is Carrie from Curly Crafty Mom. I'm loving her off-the-shoulder chambray dress! 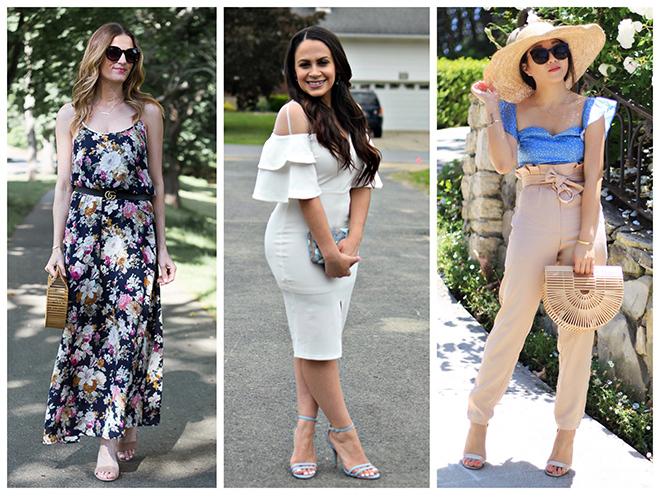 Make sure to visit her blog for some great summer outfit inspiration.